The Second Front joined Randall Packer’s Third Space Network on Saturday October 28 for a lively discussion on our twelve years of working together in online performance. It was a trip down memory lane as Randall led the discussion with some excellent and well researched questions. 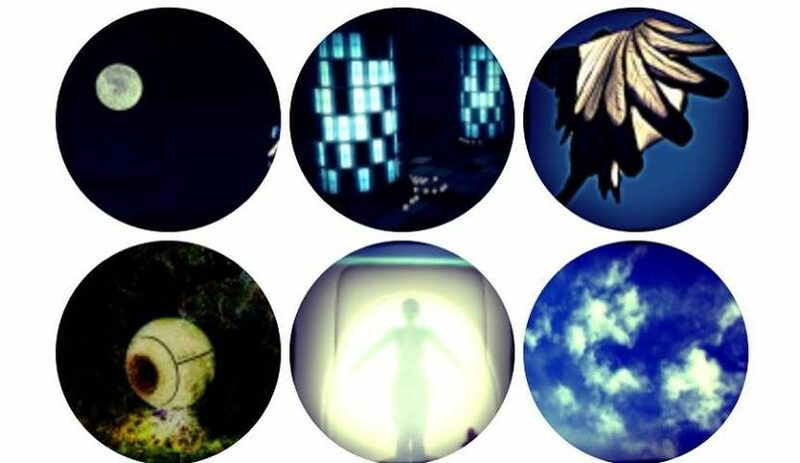 The event was open to the public and there was a virtual audience of Randall’s students from Singapore’s Nanyang Technological University, along with other artists and interested guests..
Five Second Front members joined the conversation from around the world. 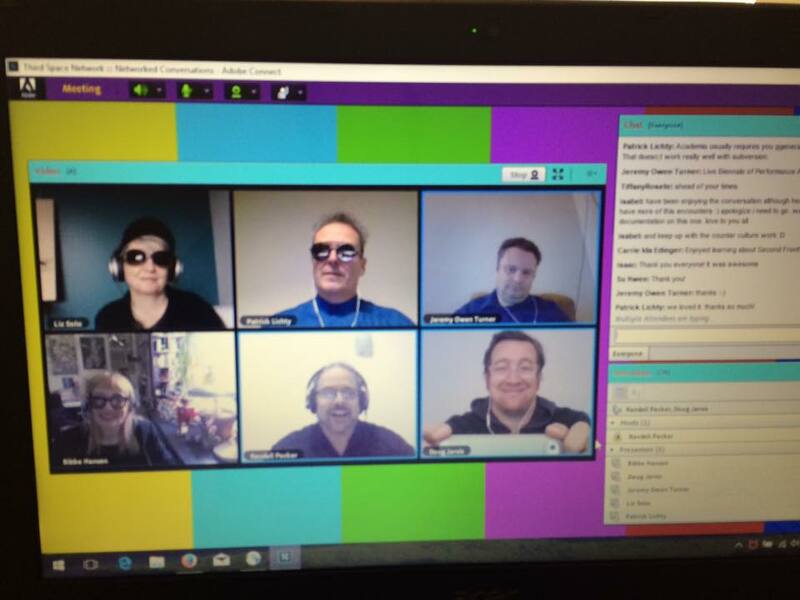 I’m in Toronto these days, Patrick Lichty is in Abu Dabai, Jeremy Owen Turner in Vancouver, Bibbe Hansen in New York, Doug Jarvis in Victoria and Randall coming to us from Singapore, The event was recorded and will be archived online on the Third Space Network. This Networked conversation was sponsored by the New Media Caucus. 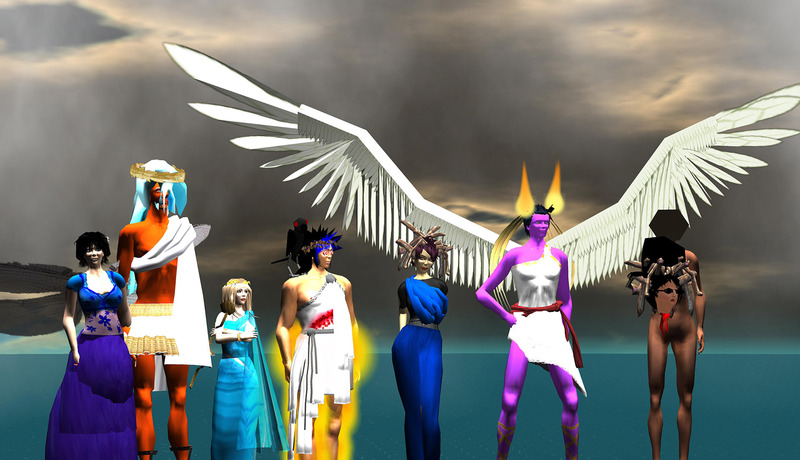 Second Front, founded in 2006, is the first performance art group in the online virtual world of Second Life. Members of Second Front who will be joining the interview include: Bibbe Hansen (New York), Doug Jarvis (Victoria), Patrick Lichty (Chicago) Liz Solo (St. Johns), and Jeremy Owen Turner (Vancouver). Second Front has performed extensively both in-world and in galleries and museums. Though the artists perform remotely their performances have been shown live in New York, Los Angeles, Moscow, Brussels, Berlin, Vancouver and many other cities. Taking their influences from numerous sources, including Dada, Fluxus, Futurist Syntesi, the Situationist International and contemporary performance artists such as Laurie Anderson and Guillermo Gomez-Pena, Second Front creates score-based performances and interventions that challenge notions of traditional performance, virtual embodiment and the culture of immateriality.